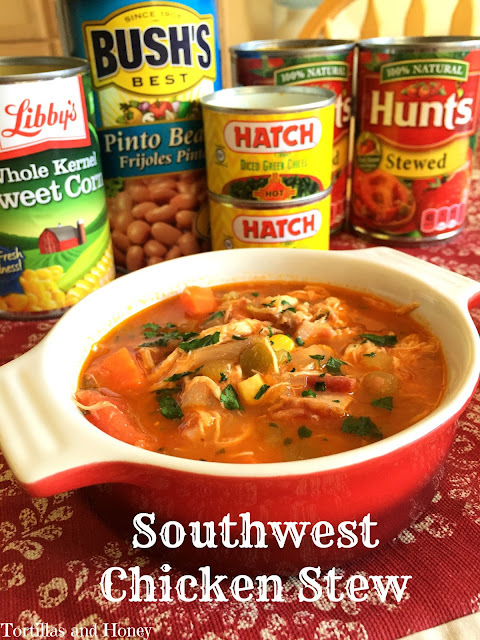 This Southwest Chicken Stew is brought to you in collaboration with Albertsons to help bring you easy recipes using canned goods to celebrate National Canned Food Month! As always, the recipe and opinions in this post are my own. Did you know that it's National Canned Food Month? If not, February is National Canned Food Month! I am working with Albertsons to help you celebrate and to bring you a delicious recipe that you can get on the table in about half an hour! I always keep canned food of some of my favorite recipes in stock that way I have then on hand for a quick and healthy meal. Especially when you're cooking with beans and green chile, you don't always have time to cook the beans or roast/peel fresh green chile or thaw/defrost frozen green chile! Another one of my favorite recipes is using canned beans to make bean burgers; it's also a fast and healthy alternative, so I always keep those ingredients on hand. Another nice thing about keeping canned vegetables in your pantry is that you can get creative with whatever you have-- just starting thinking about flavor combinations and whether or not they go together and then go from there! This stew takes about half an hour to prepare and is hearty enough to eat as a meal. I decided to dump all sorts of vegetables that I like in there, some green chile, carrots, tomatoes, and corn. And to add a little more heartiness, I added a large can of pinto beans in addition to the chicken. This recipe is a little different because I used bacon and white wine to add a little more depth to the flavor of the stew, which is something that I love to do with my dishes. Even though this stew doesn’t take long to make, it tastes like you’ve been preparing it the entire day! And, like other stews and soups, it’s better the next day! You can check out other recipes using canned products at Cans Get You Cooking. 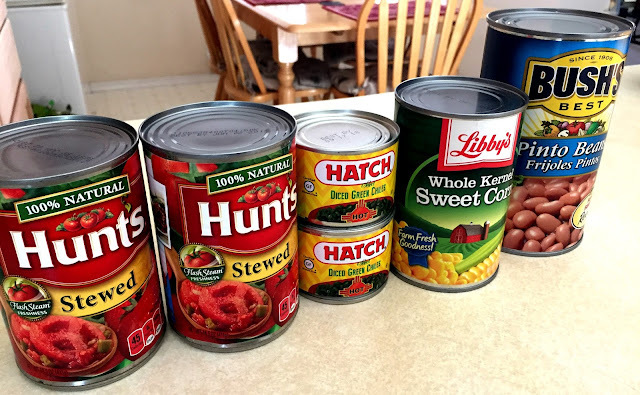 What are your favorite meals that you make using canned goods? In a large pot, cook the diced bacon over medium heat until the fat renders and the bacon is cooked through (but not crispy). Add in the onions, jalapeno, and carrots then cook until the onions are soft and translucent, 5-10 minutes. Once the onions are cooked, add in wine to deglaze pan and cook for another 2-3 minutes. Add in the minced garlic and stir for about 30 seconds. Add in the corn, beans, tomatoes, green chile, and chicken broth. Bring the mixture to a boil, then lower the heat to a simmer. Add in the cooked chicken, parsley, and onions/chives, and cook over a low heat for 20 minutes, stirring occasionally. This is a sponsored conversation written by me on behalf of Albertsons. The opinions and text, as always, are all mine. I've heard of canned foods soups and stews like this one but I love the addition of the white wine and fresh veggies in yours. Pinned it and definitely will try it out. Several years ago my mother came to live with me and one day I mentioned that I would be making chili beans after work for dinner and she asked me if she should clean out the dried New Mexico and California Chili pods and prepare the chile colorado for the beans and I told her, "No, its ok mom, I got this". Then she said, "Well should I make you fresh beans, we don't have any". Again I said it was ok, "I got this mom". When I got home she was very curious as to how I was going to pull a meal together so quickly since I didn't do or have her do any of the prep work that goes with making her world-famous (to her children and grandchildren) chili beans. So I quickly browned some ground beef and added taco seasoning and then dumped in a couple of cans of cannellini beans and a can of kidney beans while baking up a box of corn bread mix in the oven and voila! Dinner is served. She was not amused and barely ate any of it, but my kids love my chili beans and being a single working mom you have to find shortcuts!